For years I have been using a small mason jar to hold my standard bathroom implements - scissors, razor, nail clippers, tooth brush, etc. I'd have to wash out the bottom of the mason jar ever few weeks because the of the damp crud that would collect at the bottom, and the mason jar wasn't very attractive to look at. I hadn't worked with hardwood yet, so this was the perfect opportunity to try something new. When I first envisioned this project, it was important to me that the layers of wood really contrasted each other. I also didn’t want to stain the wood - I wanted to stick as close to the actual wood colors as possible. After some research online and some extensive browsing of my local lumber store, I selected four hardwoods for my cup - cherry, maple, black walnut and padauk. I got about two feet of each board, except for the walnut, because I already had some future projects in mind for it. I cut down the four woods into rough 3 inch by 3 inch squares, knowing that I would trim them down to about 2.5 inches square in the end. In hindsight, I should have been more precise with the initial cuts. I would have saved lots of time on trimming and sanding if I had squared my cuts better. I spent a few minutes arranging the squares until I found a pattern I liked. The maple, walnut and padauk boards were originally all the same thickness, so I decided to trim them further so the final layers of wood were each a different thickness. I originally wanted to inlay metal bands into the cup, so I cut grooves into the top square. Ultimately I made several errors which prevented me from inlaying the metal, so I focused on just making a nice wooden cup. With the wood clamped up, I attempted to square up the sides of the cup to be roughly flush. Unfortunately, a belt sander really isn’t designed for this - I should be using a planer and a jointer, but I don’t have those, so I had to make do. I found the center of each of the squares and drilled a pilot hole. Because I hadn’t worked with hardwood before, and I had a desire to preserve as much hardwood cutoff as possible, I opted to cut a hole with a hole saw instead of a forstner bit. The hole saw would leave me with a cut-out cylinder of wood, whereas the forstner bit would turn all of the wood in the hole to chips. This turned out to be a bad justification. A hole saw is primarily designed to cut holes in flat material like drywall or plywood, not thick blocks of hardwood. The hole saw cut a reasonable hole, but the inside walls of the hole were rough. Plus, the “salvaged” cylinder of wood is essentially unusable and not worth the effort. After cutting rough holes in the cherry, maple and walnut, I switched to the forstner bit for the padauk, and was much happier with the result. For the padauk, I used two different forstner bits - a 1.5 inch bit to cut all the way through for the drain hole, and a 2 inch bit to cut almost all the way through, stopping just enough to leave a lip for the metal drain hardware to fit over. With the holes cut, I paired up two sections and glued them together with wood glue before gluing the two glued sections together. I roughly sanded down the misaligned edges on the belt-sander until the sides were square again. This is where I unevenly sanded down the grooves I had cut for the inlaid metal. I couldn’t fix the grooves to fit the metal I had prepared, so I just widened the grooves with my router until the grooves were aligned. I’ll use the metal strips for a future project. I sanded the sides with my orbital sander, starting with 120 and then finishing with 220. The holes in the blocks didn’t quite align, so I had to use a rasp and file to clean up the roughest spots, and then used sandpaper glued to a large dowel to smooth the hole further. It’s still not nearly as smooth as the outside of the block, but it will work for my needs. Finishing the cup was a three-step process. First, to preserve as much of the red color of the padauk as possible, I opted for 6 coats of shellac, sanding lightly with 0000 steel wool between coats. Next, I applied two coats of polyurethane, to protect the shellac from water. Finally, after giving the polyurethane plenty of time to cure and degas, I applied a coat of food-safe beeswax conditioner. Small holes were drilled for the tacks of the rubber feet, and the feet were glued into place. The drain is a simple $2 sink drain cover, and clips into the 1.5 inch hole easily. I learned several important lessons with this project, including how to treat hardwood differently to softwood, and how to better plan out projects. 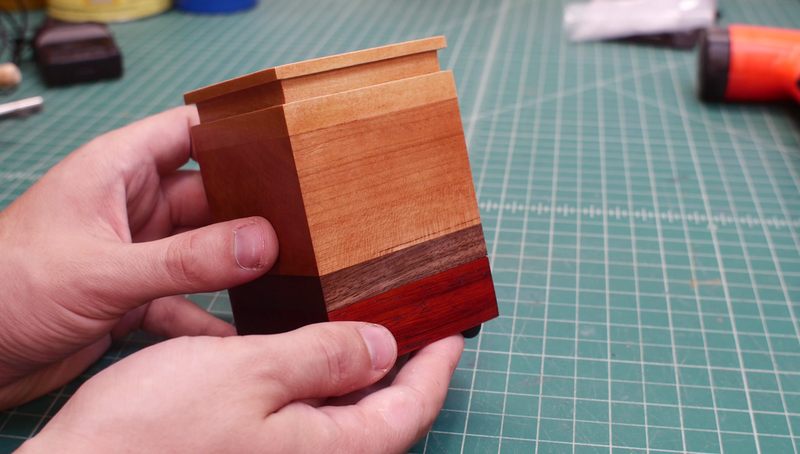 When I make a laminated cup like this again, I make a better effort in cutting the blocks of wood to more precise measurements, and not just assume "I can just sand this all square later." I will also glue up my whole cup before drilling out the hole. Drilling the blocks separately and then gluing them together lead to misalignments that had to be fixed with several hours of rasping and filing. Despite the challenges, I'm very happy with how it came out, and I want to make more cups in the future.